Figure 1: Closer look at the Alda 103A transceiver. Click to enlarge. The Alda 103 is a favorite of mine (it’s a tranceiver from the seventies, that covers the 80/40/20 or 80/40/15 meter bands on SSB and CW, and is entirely analog). I’ve worked up an “unofficial block diagram” for it – since its creators are, sadly, no longer here to create a colorful, official one. Forgive the crude Gimp drawing. I think its etch-a-sketch mode works in a pinch 🙂 . 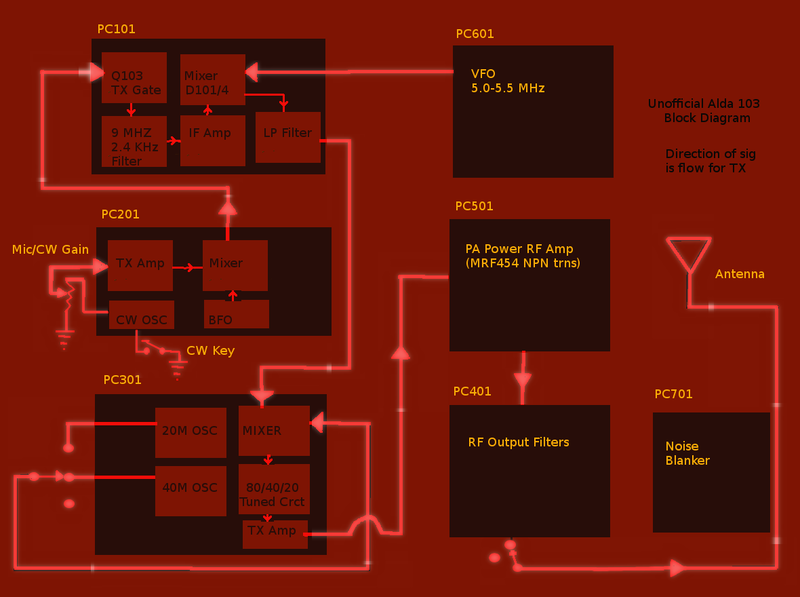 This entry was posted in Uncategorized and tagged Alda, Alda 103, Alda 103A, block, block diagram, unofficial. Bookmark the permalink.